Let’s do a quick experiment. Would you please open a new Google Tab, type in the words ‘effective social media strategy’ and look at the results? Plenty, huh? Now, type in ‘effective social media marketing team’. Not so much, right? How come people obsess over social media marketing strategy, but few bother about the importance of the team? Your people are the cornerstone of your company, not your clients. They make your business grow. They bring you, clients. They do the job, so those clients are happy. And that makes you happy at the end of the day. Your primary goal as a business owner should be to invest in your people so they can provide better service for your clients, with less effort. And when they spend less energy on repetitive tasks, your social media marketing team can produce more, in less time. So let’s pause a bit on the social media marketing strategy craze, and think about the people side of doing social media marketing. The most labor-intensive part of any effective social media marketing team is – content production, analytics and predicting user behavior. Find a way to help your team with these three key activities, and you’ll be boosting morale, boosting effectiveness, and boosting the ROI for your clients. 1. Produce Quality, Unique Content. And Lots Of It. Here is how your marketing team handle Mondays. Or any day of the week, for that matter. Folks arrive, and all get set up with a cup of coffee. There’s the weekly whiteboard meeting. 5 minutes in, the whiteboard is filled with ToDos. In the middle of it, there are other keywords including ‘Unique Content,’ ‘Tracking Progress,’ ‘Emotions’ circled too many times with a red marker. 15 minutes in, there’s no white space on the board. It’s a mess. Everybody’s overwhelmed. Let’s follow the team onto Scene 2: Watercooler complaints. If you’ve done ongoing Social Marketing for blog posts, you already know that sharing that blog post on social media creates traffic bumps. But you’ve also seen that reposting the same update regularly, gets boring and the audience doesn’t respond. Or responds by unfollowing the page. This is why seasoned social media marketing agencies create unique updates. They all point to the same blog post, but at least the Feed is not filled with duplicate content. But, creating unique content for every social media platform, every time you need to schedule a campaign is not an easy job. Yet, to every problem, there’s a solution. Agencies have their systems for manual content creation. We have Populizr. It helps social media marketers automate the creation of social updates from any blog post or a product page. With Populizr For Agencies, your team can create up to 25 unique variations from a single blog post’s Title/Description/Image, and schedule them on 5 major social media platforms: Facebook, Twitter, LinkedIn, Pinterest, and Google+. You can literally create an entire campaign around any blog post, in as little as 4 minutes. 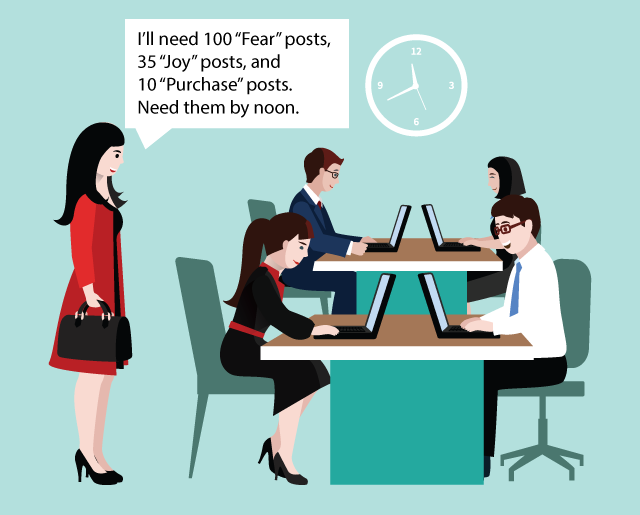 By Wednesday, your marketing team may still struggle with the basic requirement for every single social post: how to craft an engaging update that pushes the right buttons with the audience, so they’d react in a measurable, profitable way for your client? Why is this such a painful question? Because just on Facebook and Twitter combined, there are over 4 Million new posts, every minute. You want your updates to be noticeable. You want them to make an impact. Otherwise, you’re just part of the noise. And how do you ensure that your team’s social updates make an impact? Using Emotions and Sentiment Analysis. Have a blog post that is supposed to inform the readers of a cool new service, and convince them to call your client? You’ll want to make somehow sure that your social updates have the right mix of words that describe their emotional state of pain and frustration. And, that you have enough positive, exciting words that will encourage them to actually click the link and visit the website. If you multiply this by 20 (i.e each workday gets a unique social update), and then multiply it by say 10 (10 blog posts per month), you’re looking at 200 social updates that need to be tweaked in such a way that they attract social attention, and convert it into social traffic on the website. Then take at least 10 minutes to tweak the copy of each one, and you’re looking at a full week’s work. That’s a lot of work. Populizr has a built-in Sentiment & Emotion Analyzer that helps you see how your audience will react to your post even before it’s published. This way, you can fine-tune your campaigns and hit the right emotions of your client’s target audience. On Thursdays, your marketing team may have difficulties with another problem: figuring out which active social campaigns are performing properly, and which are only creating noise. Most social media marketers will want to present Likes, Shares, Comments, Retweets as valuable engagement. But you as an agency owner, know that clients don’t pay for likes. Likes don’t create leads. Traffic creates leads. And clients like social traffic. This is why it’s very important to show your clients the metrics that matter. Targeted traffic is the key deliverable for any social media campaign. And when the time comes to do the report, your team is running around Analytics dashboards to figure out what’s going on and paint a good picture to your client. And you’ve seen more than once, that what Facebook says doesn’t align with what Google Analytics reports. You’ll say: It’s traffic, man. How hard can it be to figure it out? Instead of trying to figure things out and pick which stats you’ll include in the report, wouldn’t it be great if you can give your team a tool that tracks every single website visit, generated by every single social update, from every social network your client is using? Here’s where Populizr steps in. You can easily manage and track effectiveness on all of your client’s social media accounts from a single dashboard. Cool, right? Reporting how much traffic came from each social post, from every social network, is as easy as dropping a screenshot of the report. Your team’s Analytics and Reporting work should just be the cherry on top. And it should take as much time to do it. If your team is wasting tons of time figuring things out, you are wasting a lot of valuable time on non-money-making activities. You can now easily serve more clients since Populizr will do all the manual work for you. All your team has to do is to click a few times on the mouse, and you got yourself a happy client. It’s 3 pm on a Friday and the end of the month. Your marketing team is getting ready for their well deserved weekend. Now it’s time to make that report for your client that you’ve avoided for a long time. But this month, you’ve actually had real results to show. You’ve managed to finish the delayed work for your client thanks to that social media automation tool you’ve found. All the social updates your team created were more engaging than ever before. 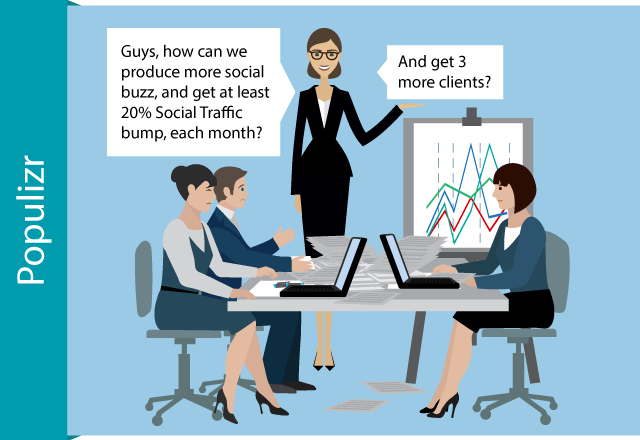 Your client’s website got a solid 20% traffic bump, and most of that is thanks to Social Traffic. All that extra traffic meant more leads to your client. Putting together a monthly report takes you a few minutes. You pick the date range, make a screenshot of the traffic generated from each of the 10 blog posts, with granular data of each of the 200 social updates, on all 5 social networks. How’s this for a scenario for your last hour of work this week? Sounds good? Give Populizr for Agencies a try. Your team can consistently provide more value for your existing clients, with a lot less effort. Guess it’s time to get a few new clients, don’t you think? One tool – many satisfied clients. Get Populizr for Agencies Today.